Since we moved to Indiana 4 1/2 years ago, David and I have chosen to use only our cell phones and fore-go the cost of a land line. So our boys haven't had much experience with a phone that actually has a cord. Grandma and Grandpa Fry also only use cell phones, and most of the phones at Grandma and Grandpa Wolf's place are cordless. BUT! Aunt Chelle has a delightful old rotary dial phone in her room. It's red! And it has a cord! It cracks me up that this was a new experience for our boys. 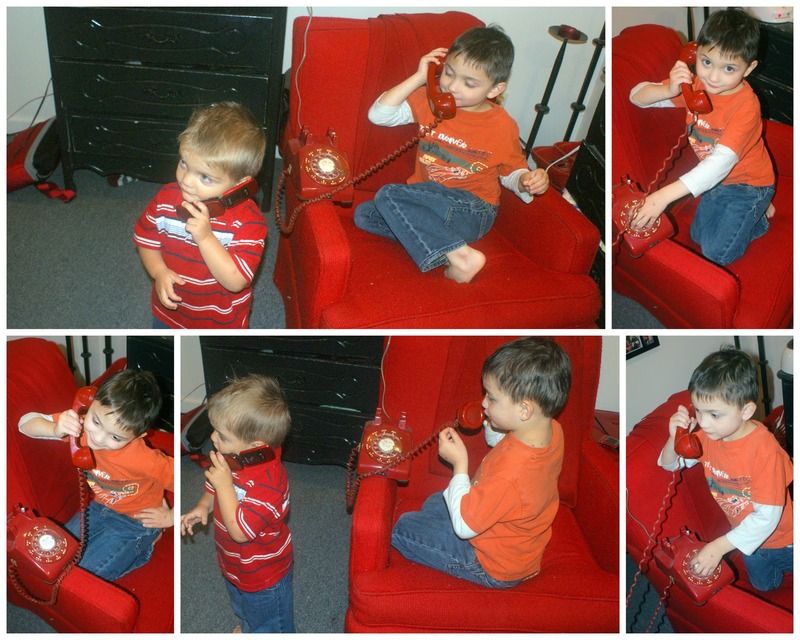 They even called each other using Aunt Chelle's cell phone (also RED) and room phone. And then one of us had to go in the other room and get on the other phone to prove to them that several people can talk on a landline at once from the same house. It's a funny world these boys live in....Video chat across the Atlantic ocean with Aunt De in Ireland? Everyday stuff. Instantly text Aunt Debbie across the Pacific ocean in Hawaii? No big deal. But a phone with a cord was a big deal. Makes me feel old. My kids are certainly growing up in a different world than I did.